We went through our preparations including a short warm-up ride, run, and visit(s) to the oh-so-clean portalets. Despite being some of the earliest to arrive we were among the last lingering in transition when it closed. Being ushered out by the volunteers made J$ uneasy, but it seems this has become tradition for me; there is something oddly calming about being one of the last to exit. I don’t pay much mind to those telling me to leave, as there is usually plenty of time before my wave starts anyway. We made our way down to the water’s edge and for the first time I took a look at the swim course in its entirety. Heading into the race I'd set no expectations for the swim. Though I had been swimming 2-3 days a week my volume was way down; I just hadn't quite been able to get back on the horse since my surgery. 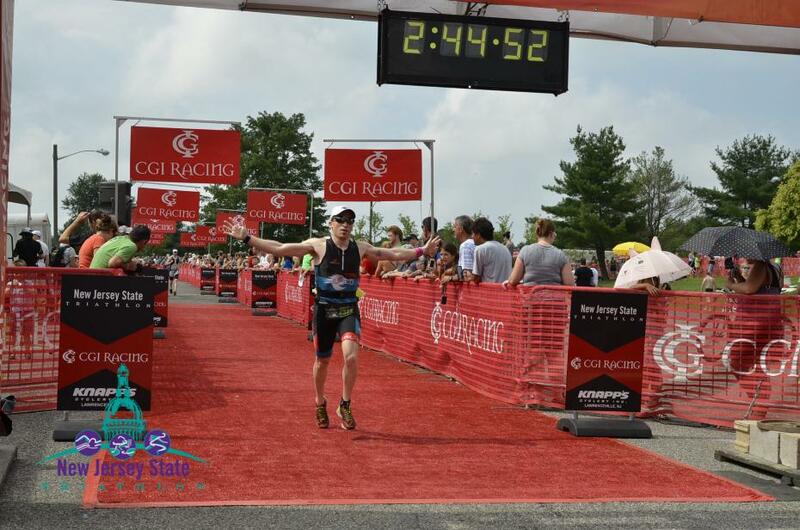 My only goal was to finish the swim without expending a lot of effort and set myself up for a strong bike and run. As the race approached and I did more research about the course and conditions I learned that the typical race day water temperature was in the upper 80s. I don't think I've ever swum in water so warm and wondered what it would be like. On race morning the announcer (who did an awesome job) was quick to point out that the temp was 90 and was so warm that it would not be refreshing: true story. My wetsuit is a major crutch for me on race day, but in NJ I'd be limping along without it. The thought of that, along with knowing that there would be no added buoyancy from the fresh water lake made me a bit uneasy. My wave was set to begin 10 minutes after the pros went off. At 7:35 we entered the water and I took my rightful place towards the back and side of the group. When the gun went off I slowly began my swim, determined not to start out too quickly as I have often done. My wave of 30-34yr old men and the Clydesdales was large but there was only some slight banging in the water. Before long I was behind most of my wave and I didn’t have to worry about contact until some folks in the next wave began swimming over me. The swim itself was pretty uneventful which is exactly how I like it. I didn’t push hard and instead maintained a relaxed but steady pace throughout. 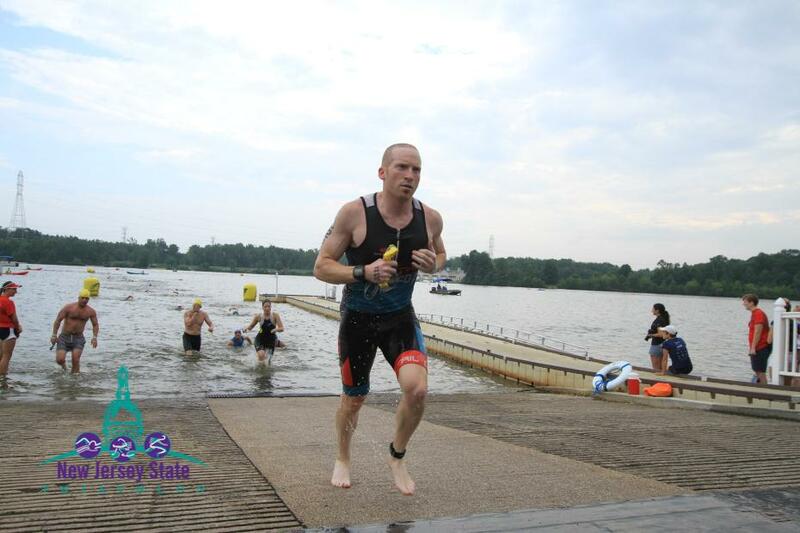 As I approached the swim finish I felt great and was ready to lay it all out on the bike and run. Transition practice a week before the race paid off big time! The repetition of practicing the simple steps of putting on a helmet and sunglasses made life so much easier on race day. During practice I struggled with getting my feet in my bike shoes while riding but a few dress rehearsals and a dose of Body Glide on the inside of the shoes solved my problem. Comparing T-times from race-to-race is a bit deceiving; at a glance my time seems long but once you consider the long trot from the transition exit to the bike mount you can see that my time was actually pretty respectable for my age group. The word on the street was that this bike course was fast and it certainly did not disappoint. Driving the course the day before the race confirmed that it was as flat as described and was designed for speed. I was a bit nervous about possible congestion but only the turns served as mild bottlenecks. The course wasn’t the most scenic I’d ridden but it wasn’t terrible. It was well-marked and the red spray paint indicating rough or uneven road was a nice touch. There was apparently a change from the previous year due to some construction which resulted in a twist section through the nearby community college. This part of the course was extremely congested and hopefully won’t be part of the race again. I was feeling great as I hit the saddle and quickly slid my shoes into my feet. I had caught my breath in transition and settled into a solid pace from the get-go. I looked down early on and saw that I was riding at a solid clip (20+); I wondered if I’d be able to maintain my pace but I let my heart-rate and cadence be my guide (as I usually do). Knowing that there were no hills to contend with meant that I could hold my pace and keep on pushing. By this point in my tri-career I know that I will be well-behind in my age group when I exit the water but I’ve worked hard to be able to make up ground once I hit terra-firma. If early signs were an indicator I was going to have a strong ride. I stayed very consistent with both my speed and effort and I was passing people left and right. The only real pushes that I made were through the turns which no doubt helped keep me from losing time. Just as I’d done on many of my early training rides in South Florida after slowing through the turn, I stood up and powered my way back up to speed. This strategy was clearly working as I passed even more people through the turns. The only snag I ran into during the bike was running out of fluids. For some unknown reason I had chosen to only put one bottle on my bike and by about the halfway point of the ride I was already out of Nuun. Rather than just try to get by I actually slowed up next to another rider who had enough bottles for an Iron-distance race and asked if I could have a bit of Gatorade. Luckily he obliged and shared some much needed hydration; I thanked him and pedaled on through the remained of the loop. At the end of the ride I sped towards the dismount line and smoothly hopped off my bike without breaking stride. After the short run back to my rack I quickly made my preparations to run, but there was a problem: I could only find one sock! J$ and I happened to be in transition at the same time and I yelled to him about my predicament, “dude, I can’t find my sock.” To my surprise, before he could even reply I heard a girl yell from a couple of racks away that she had an extra sock. Who has an extra sock? That girl did! She must have been on a relay team or something because she didn’t seem to be in a rush and she jogged over and handed me her hot pink sock. With my second borrowed 2nd sock in place I ran to the exit which was easily found by listening to the volunteer yelling, “run away from me!” Best. Volunteer. Ever. My overall T2 time was less than stellar but considering the circumstances I’ll take it. If only I could run sans socks I could probably shave off a bunch of time, but I just don’t see my blister-prone feet allowing that to go down. The 10K run portion took racers on a shaded loop through Mercer County Park. The park and its paths were nice and despite being a bit congested at points it was a really enjoyable run. After getting off to a comfortable start I developed a pretty painful stomach cramp at about one mile in. Despite running at a pace that I had easily sustained many times during training I had to pull it back a little bit. I popped an extra salt tab, had some Nuun, and enjoyed the cold towels provided at the aid station. As I tried to work out the cramps I heard someone yell my name and I realized that J$ was not too far behind me (he had smoked me out of the water but I mowed him down on the bike). I hesitated a bit more so that he could catch up and we ran together for the next couple of miles. Somewhere around mile four the cramps dissipated and my body was ready to lay it all out there. I gradually picked up my pace and continued to build speed over the remaining distance. I'm still not sure what caused the cramps as I had completed many long brick runs (after much longer rides than an Olympic-ride) where I felt just fine. I supposed it could just come down to not exerting as much effort during training as I do on race day. Regardless, I was a bit disappointed in my run time mainly because I know how I am capable of performing. Hats off to CGI Racing for putting together a very well-run race. The course, which wasn’t the most scenic nor the most boring, made for a fast, and safe day. The timing of this race means it will almost undoubtedly be hot and I don’t think it has ever been wetsuit legal. That said I would definitely consider racing again as it is a close-to-home getaway race. The race ended up being the perfect tune-up for Timberman and might be well-timed before Ironman Mont Tremblant next summer.